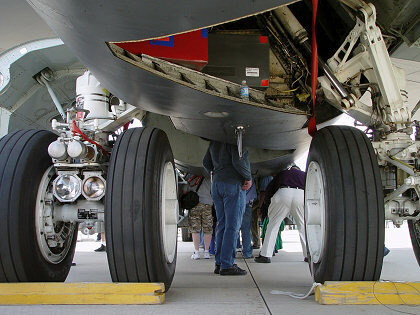 Crouching under the fuselage, looking aft at the forward landing gear. The mass of people farther back are looking up into the bomb bay. 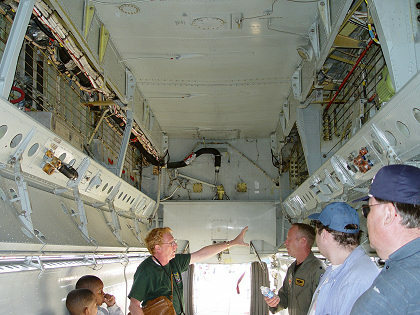 Looking inside the wheel well for the landing gear at the very intricate mechanisms, plumbing, and wiring. 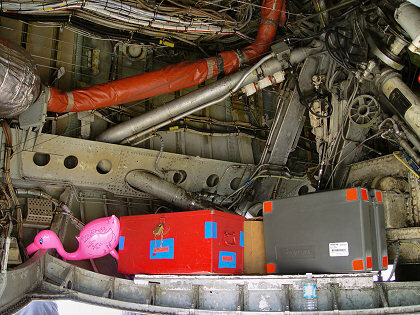 There were a few toolboxes stored there as well as a plastic pink flamingo (government issued??). Looking up into the bomb bay. A pilot was on-hand to answer questions (the farthest person on the right). The flat area overhead was probably the bottom of a fuel tank, since there were multiple small drainpipes on the bottom.